You can find flour milled from most any grain these days. Now, you also can find flour with red wine in it. Cabernet Sauvignon, to be exact. Earlier this year, when I was strolling through the Tyler Florence Shop in Napa, I spied bags of Cabernet Wine Flour and Cabernet Cocoa Powder, both of which I just had to buy. After all, it’s pretty hard to resist their striking reddish-brown hues. They’re made by Marche Noir Foods of Irvine, CA. The wine flour is made from the pomace (skins) of Cabernet Sauvignon grapes after they are crushed. The skins are dried, then milled into a powder, which apparently is high in iron, fiber and Resveratrol (a natural anti-oxidant). 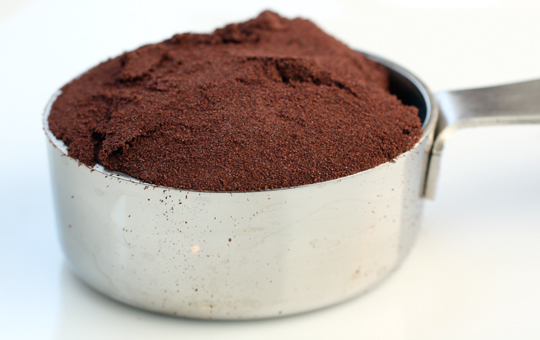 The Cabernet Cocoa Powder is just dark cocoa powder mixed with the Cabernet Wine Flour. A 10-ounce bag of the Cabernet Wine Flour was $14.95 at the store; a 10-ounce bag of the Cabernet Cocoa Powder was $9.95. I couldn’t wait to try baking with them. 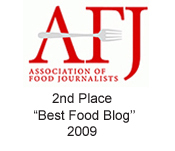 The Marche Noir Web site is a good place to start for recipes. 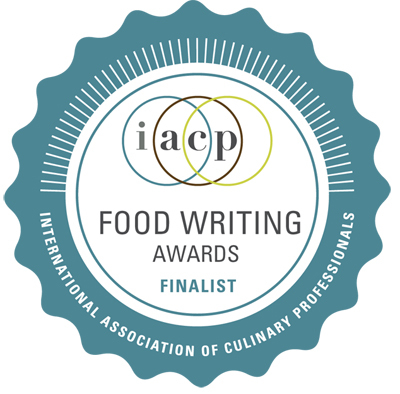 I zeroed in on the one for “Cabernet Velvet Cupcakes with Ganache Glaze,” which incorporates both the wine flour and cocoa powder. The recipe also calls for red food coloring, but I left that out. 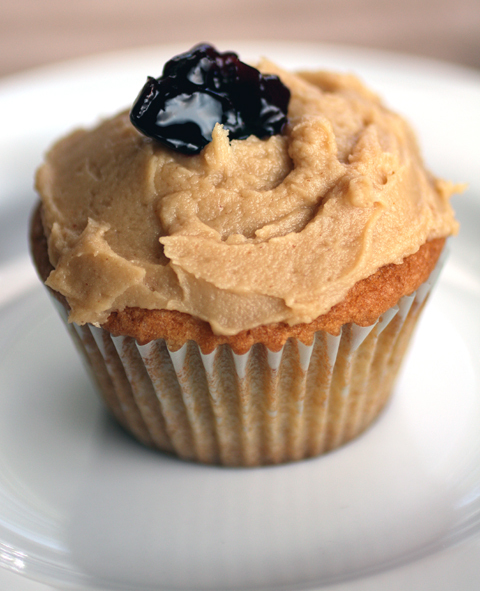 The fluffy, mousse-like batter results in cupcakes with a light, tender crumb. They look like fudge cake. But the taste is more adult. You can actually discern fruity, sweet, dusty, and tannic notes from the addition of the wine. I’ve since experimented more with the Wine Flour by substituting a few tablespoons to a quarter cup of it for regular all-purpose flour in recipes for brownies and chocolate cookies with great success. Just think: Now you can have your wine — and bake with it, too, in a whole new way. To make cupcakes: Preheat oven to 350 degrees. Line cupcake pans with liners. Combine buttermilk, vinegar, vanilla and red food coloring (if using), and set aside. In a bowl, sift together cake flour, wine flour, cocoa powder, baking powder, baking soda and salt. Set this aside as well. Crack eggs into a measuring cup and let them sit out at room temperature until tepid. In the bowl of a stand mixer fitted with a paddle, beat unsalted butter for 1 minute on medium-low speed. Add sugar gradually and beat butter and sugar for at least 3 minutes, or until mixture is pale and fluffy. While mixer is still going, pour in eggs, one by one. Wait until each egg is incorporated into the batter before adding the next. Before adding last egg, stop mixer and scrape down the bowl and paddle to get all of the sugar and batter incorporated. Add last egg and mix until homogenous. Stop the mixer. From here on out, only use lowest speed setting. Pour in half of the dry ingredients and mix on low until barely combined. Stop the mixer and pour in half of the wet ingredients. Again, mix on low until barely combined. Stop the mixer and pour in 1/2 of remaining dry ingredients. Alternate the last fraction of the dry and wet ingredients, alternating and mixing only until barely combined. Stop the mixer and remove bowl from machine. Using a rubber spatula, fold batter once or twice making sure to incorporate everything gently. Using an ice cream scoop, fill each cupcake paper 3/4 full. Bake for 14-18 minutes, until tops are amber and spring back when touched. You also can use a tooth pick to test the cake and ensure that the middle is baked through and not liquid. Remove cakes from the oven and let cool in the pan for 15 minutes. Lift cupcakes ou of the pan when still slightly warm. To make glaze: Let cupcakes cool completely. Make ganache by boiling heavy cream in a medium saucepan. Pour the boiled cream over 8 ounces of dark chocolate. Whisk to combine. 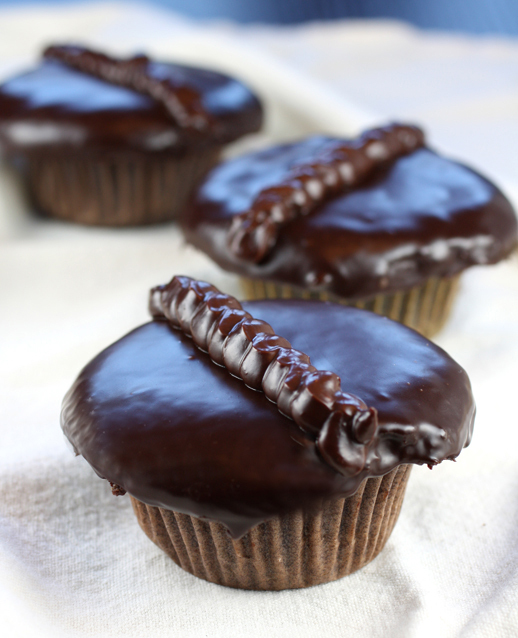 Dip each cupcake in the chocolate glaze, letting excess drip off. Turn cupcake right side up to let glaze set. The extra glaze can be allowed to cool and thicken, then used to pipe designs with a piping bag and decorating tip. Wow, that is AWESOME! Those cupcakes must taste amazing. I wish I could find that product here. What a great idea!!! Sounds heavenly. Cool idea. 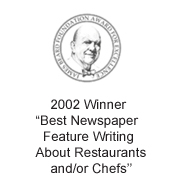 That Tyler Florence store has some unique cooking things! I’ve never heard of this and totally wish that I can try! I was just in Irvine! 🙂 Looks fantastic, if I can get my hands on some I’ll definitely be trying this recipe. I’ve had cabernet chocolate before (both in bar & drop form) and the Flavour really comes through (though that was wine-soaked raisins dried & combined with the chocolate). I can imagine Cabernet cocoa would be great too. Leave it to Tyler to come up with something that awesome! Great idea! Thanks for writing about it 🙂 Just called Marche Noir to order, but they’ve discontinued the Blended Cocoa Powder 🙁 If you want to blend your own, the ratio is 3:1 of Dark Cocoa to Wine Flour. I am definitely going to check out the wine flour and Cabernet Cocoa flour! They both sound fabulous and those cupcakes – awesome! I want to eat the photo of those gorgeous cupcakes with the whacky-wide icing tops. Arrrgh! I’m on a diet this week as I’m filming something and those cupcakes look A-MAZ-ING! 🙁 Please eat one for me! And I’m going to look for this wine flour too! What a product! 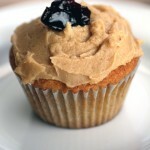 It’s such a fascinating idea…I bet it lends amazing flavor to these cupcakes! Perfect combination – Dark coco powder and Cabernet wine flour. What a beautiful cupcakes staring at me to be grabbed! Have a great week Carolyn! I never even knew wine flour existed! The cupcake looks absolutely amazing, just want to dig into one right now! 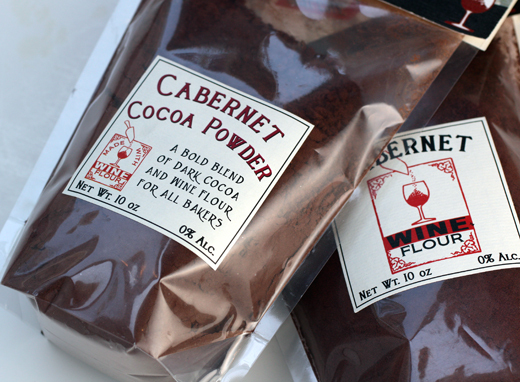 Wow, Cabernet wine flour and cocoa powder are a fabulous find! And the cupcakes look just heavenly! I’ve tried a similar product from http://www.wholevine.com. Have used in no-knead bread which is great, especially the syrah with rye. Will have to try your cupcakes but would substitute regular cocao powder. Beautiful cupcakes! And I love the use of the wine flour and chocolate. I just tried to find the website to purchase more of the wine flour from Marchenoirfoods.com and their website doesn’t exist anymore. Does anyone know if they are still around and still making this flour? Hope that helps. If I spot any others, I’ll let you know.